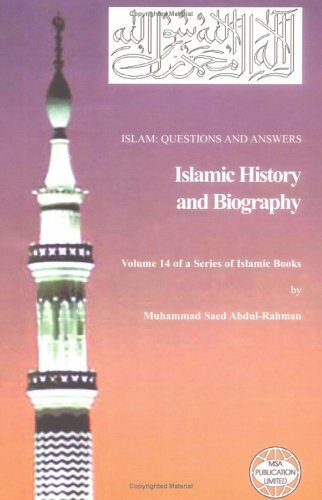 This book, Islamic History and Biography, is the fourteenth volume of a series of authoritative Islamic books entitled Islam: Questions And Answers. The overall series discuss issues relevant to Islam, and present accurate and reliable information based on the true beliefs and practices of the Prophet (Peace and Blessings of Allaah be upon Him) and his companions. The objectives of the various books include: to teach and familiarize Muslims with various aspects of their religion to be a source for guiding people to Islam to assist in solving the social and personal problems of the Muslims in an Islamic context The books are directed towards Muslims and non-Muslims alike. Subject areas include, but are not limited to, Islamic fiqh and jurisprudence, Islamic history, Islamic social laws (including marriage, divorce, contracts, and inheritance), Islamic finance, basic tenets and aqeedah of the Islamic faith and tawheed, and Arabic grammar as it relates to the Qur'an and Islamic texts. The books are compilations of questions and responses about Islam, from both Muslims and Non-Muslims. The responses are handled mainly by internationally re-nowned Islamic shaykhs and scholars, including Shaykh al-Islam Ibn Taymiyah, Ibn Katheer, al-Albaani, Shaykh Ibn Baaz, Ibn al -Jawzi, Ibn al-Qayyim, Al-'Izz ibn 'Abd al-Salaam, al-Nawawi, Shaykh 'Abd al-Kareem, al Khudayr, Al-Dhahabi, al -Qurtubi, Al-Sindi, al- Shawkaani and al-Bastawi using only authentic, scholarly sources based on the Qur'an and sunnah. References are provided where appropriate in the responses. The book provides the reader with cross references of other pertinent responses not necessarily in the same volume, but also in other volumes of the series. However, each volume is complete in itself. The book records accurately the answers the contributing Sheikhs and scholars gave to the questions put to them.